Bookmark assigned assignments on the Dashboard. This is a listing of all the tasks across projects that are assigned to someone. You can easily filter these tasks according to a specific user or project. Looking for a list of all the tasks you've created? Look at your profile where you can find section the tasks you’ve created in which you have all the tasks you’ve created. You set Freelo to remember your filter until you change it. Filter assigned tasks on Dashboard. Do you need to see tasks that no one has assigned? Go to a specific project in the To-Do list section (top menu under project name). On the right, click the Filter button. From the Show Tasks tab, select Unassigned. My tasks priorities help you plan your bussy day comfortably. You can star any Freelo task and add it to this short list. If you complete the task directly by clicking the checkbox on the priority list, it will automatically disappear from your list. If the task is completed by anyone in the application, the task in the My Priorities list remains with a clearly visible strikethrough, which indicates that it is completed. If you leave task on the list, it’s up to you. You can scroll up and down the task by dragging the right part of the task line. To remove tasks from the list, click the star in the right part of the task line. Looking for a list of all the tasks you've completed? Easy help. On your profile, you’ll find a section of your completed tasks with lists all the tasks you’ve completed. If you feel that too many notifications are going on, this section will help you. It’s a list of all Tasks and To-Do lists where you have set up tracking and are going through email or application notifications. Does the number of e-mail notifications sent bothered you? Look in Settings and in the Notification E-mail section, change your e-mail preferences. The best way to track activities on projects. 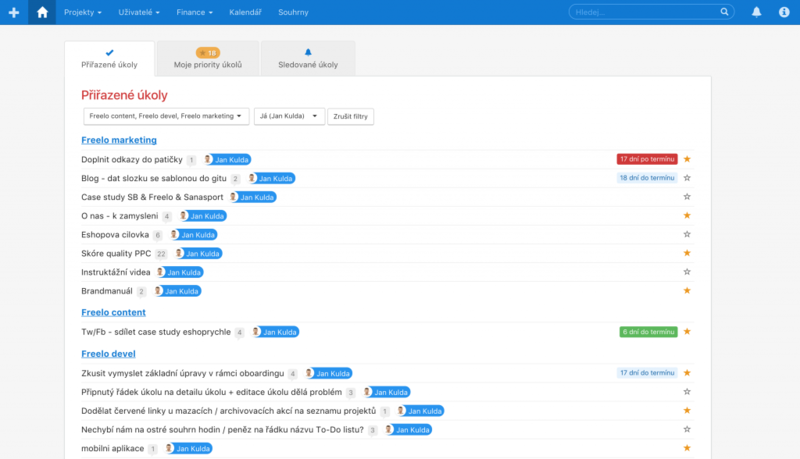 Shows all important actions over Tasks, To-Do lists, Projects, and Notes. Every task has a discussion in which there are a lot of comments. In this section, you will see all the discussions that crossed projects over the last time. Simply click on the small bubble icon with a number of comments. This will display the entire discussion window. A list of tasks that are cross-finished projects completed lately.